I don’t often post pictures from the excellent Astronomy Picture of the Day but today’s is so beautiful I couldn’t resist. 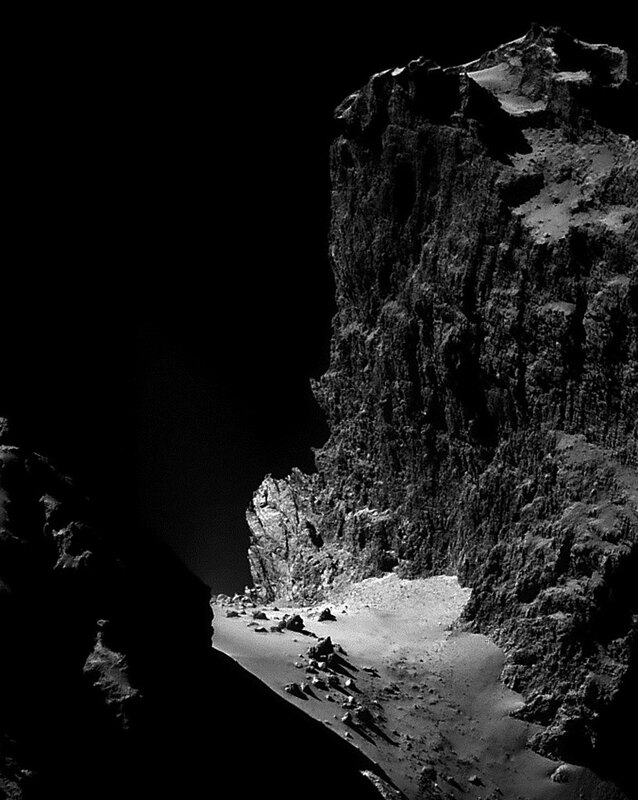 These high cliffs occur on the surface of a comet. 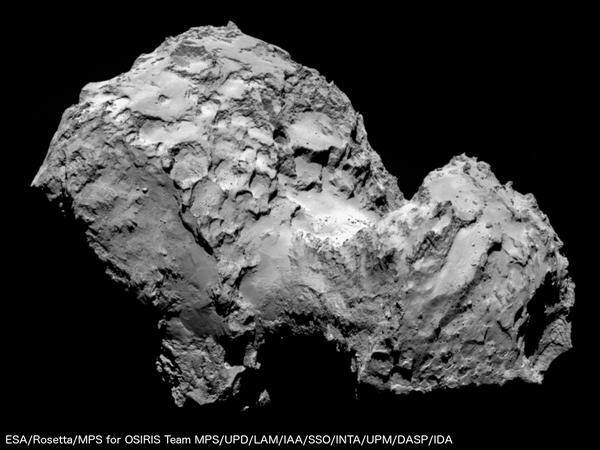 They were discovered to be part of the dark nucleus of Comet Churyumov–Gerasimenko (CG) by Rosetta, a robotic spacecraft launched by ESA which began orbiting the comet in early August. The ragged cliffs, as featured here, were imaged by Rosetta about two weeks ago. Although towering about one kilometer high, the low surface gravity of Comet CG would likely make a jump from the cliffs, by a human, survivable. At the foot of the cliffs is relatively smooth terrain dotted with boulders as large as 20 meters across. Data from Rosetta indicates that the ice in Comet CG has a significantly different deuterium fraction — and hence likely a different origin — than the water in Earth’s oceans. The Rosetta spacecraft is scheduled to continue to accompany the comet as it makes its closest approach to the Sun in 2015 August. 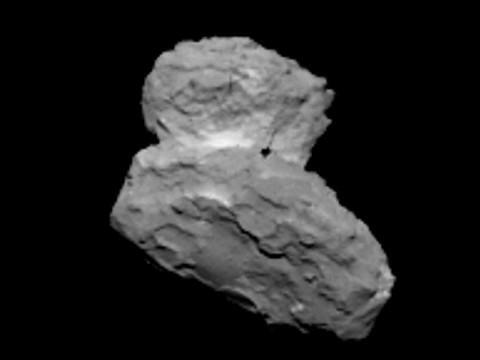 For me, Rosetta has undoubtedly been the science highlight of the year. It has been an absolute triumph, and it’s not over yet as Rosetta will now follow the comet on its journey towards the Sun. With a bit of luck, the lander Philae will also awaken (hopefully in March) as the Sun begins to shine more brightly on its solar panels. I think we should all wish a special Merry Christmas and Happy New Year to everyone involved with this wonderful adventure! 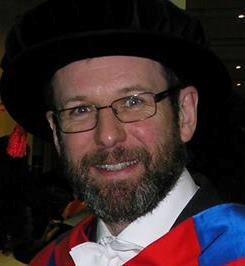 Time to break radio silence, so to speak, with a short post about the main event that’s happened in the astronomical world while I’ve been indisposed, namely the separation of the probe Philae from its parent spacecraft Rosetta and subsequent successful landing on Comet 67P/Churyumov-Gerasimenko. There’s been a huge amount of media coverage and in-depth specialist analysis of this going on over the past few days, and it isn’t reallly in my own area of specialism, so there isn’t much point in trying to do my own version of events here. If you’re looking for a science briefing then you could do a lot worse than the official European Space Agency web pages here. I’ll confine myself to a few general reflections. First, as has been widely reported, the final stages of Philae’s approach were clearly a bit hairy (appropriately enough, since the word “comet” is derived from the Greek word for “hair”). Although it homed in on its intended landing site pretty accurately, when it got close the thrusters intended to help it settle onto the surface didn’t fire and the “harpoons” supposed to fasten it to the surface also failed. 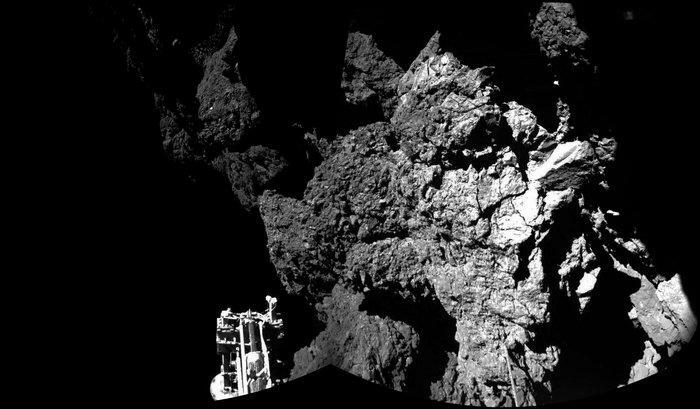 As a consequence of all this, Philae bounced off the surface, floated in space for about two hrs, during which it travelled about 1km across the surface of the comet; that’s an average speed of about 0.14 m/s relative to the surface of the comet. It then encountered the surface again, bounced again for about 7 min, and then come to rest on 2 legs, with one pointing into space, against a cliff on the edge of a crater, with only one solar panel in operation because of the shade from the cliff. It’s worth noting that the escape velocity from the surface of Comet 67P/Churyumov-Gerasimenko is only about 0.5 m/s and the probe met the surface of the comet at about twice that speed. Without significant intervention to stick it down, Philae could quite easily have bounced off and into space forever. The loss of the thruster and the failure of the harpoons made that a very likely outcome, but the mission’s luck held out. Fortune favours the brave. It then became clear that the rate at which Philae was using power from its batteries was exceeding the rate at which it could recharge using its solar panel. For a time it was by no means obvious that it could perform all its science tasks in the short time (~60 hours) remaining before it would run out of juice, but in the end, according to the experts, it did accomplish about 80% of its science goals before going into hibernation. I’ve heard some folk – including a few astronomers – claiming that Philae’s difficulties have cast a big shadow over the Rosetta mission. That’s clearly nonsense. In fact, the odds that Philae would ever attach itself to its target were only about 50-50. And even if it did succed there was a chance some of its on board instruments may well have failed. After all, they had spent 10 years in the hostile environment of space waiting to be called into action. As it turned out, Philae’s achievements are at the upper end of the range of expectations. But even if the probe had failed entirely then there would still have been the huge amount of science being done by Rosetta itself. Overall, I think the mission so far has been a stunning success and there’s a lot more to come. From a non-scientific point of view the perilous landing of Philae was even a bonus, as it made a public that is in danger of becoming blasé about spaceflight realise (a) that it is incredibly difficult and (b) there are people clever enough to make it work. The tension that mounted as events unfolded had people gripped largely because people could see in their mind’s eye this little thing, like a washing machine on legs, bouncing about in slow motion across an alien landscape. It was a drama largely acted out in our own imagination, and all the more absorbing for that. 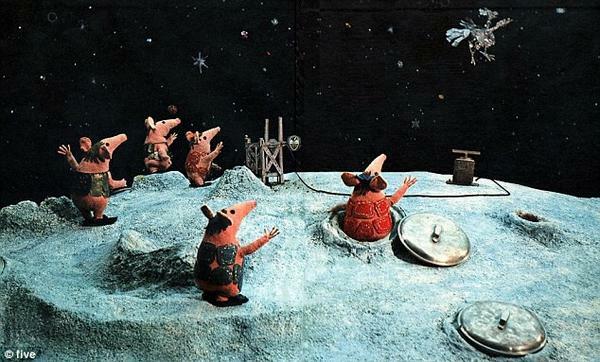 Yesterday I was chatting with a friend who was trying to understand what Philae was doing as it bounced. It is quite difficult, if you think about it, to apply physical intuition to this situation. On the Earth we think of the “up” and “down” directions as being unambiguously defined, but “up” actually means two different things: (i) perpendicular to the Earth’s surface; and (ii) in the opposite direction to which gravity makes things fall (“down”) . On a spherical object such as a planet, gravity acts towards the centre, hence “what goes up (i) must come down (ii)” . This means that bouncing up off the surface does not necessarily result in coming straight back down again – gravity may well pull in a quite different direction. Add to that the spinning of the comet and its uneven surface, and you can understand how difficult it was to figure out where Philae ended up and precisely how it had got there! Another comment I’ve heard concerns the cost. At €1.4 Billion it does sound expensive, but divide that among the population of the European Union (currently over 500 million) and it doesn’t sound so much, about the cost of a cup of coffee, and remember that the mission has lasted over years. Philae has succeeded in generating a huge amount of scientific data and I have no doubt that important conclusions will soon be drawn from the measurements it has made, but it’s not just the science that justifies the (modest) pricetag. Rosetta is an achievement that all humanity can celebrate. It is a demonstration of what we can achieve collectively if we have ambition, imagination and determination. Setting ourselves targets and reaching them. Asking ourselves questions and answering them. This is what makes us humans what we are. Venturing into space changes our perspective on our own world, something we need to do urgently if humanity is to survive on Earth. Just a quick post to remind you (as if you needed it) that, in about 5 minutes’ time at 10am BST, the ESA spacecraft Rosetta will begin its encounter with a comet (actually Comet 67P/Churyumov-Gerasimenko). Rosetta’s journey began on 2 March 2004 when Rosetta was launched on an Ariane 5 from Europe’s Spaceport in Kourou, French Guyana. Since then, the spacecraft has orbited around the Sun five times, picking up speed through three gravitational “slingshots” at Earth and one at Mars, to enter an orbit similar to that of its target, said comet 67P/Churyumov–Gerasimenko, which is in an elliptical 6.5-year solar orbit that takes it from beyond the orbit of Jupiter at its furthest point, and between the orbits of Mars and Earth at its closest to the Sun. The spacecraft will then travel alongside the comet as it approaches the Sun. In November 2014 the Philae probe will be deployed and will land on the comet surface. Rosetta will follow the comet to its closest distance to the Sun on 13 August 2015 and as it moves back towards the outer Solar System. The nominal mission end is December 2015. I bet there’s quite a lot of stress in the ESA control centre in Darmstad, Germany, as the probe’s epic journey nears its end, not least because telemetry is lost while the burn happens. Those ten years in space will count for little if something goes wrong now. Good luck everyone involved! You can watch a live feed of the encounter here. UPDATE: after an agonizing wait – it takes 23 minutes for telemetry to reach Earth from Rosetta – the spacecraft has entered orbit correctly. Well done everyone! UPDATE: click here for an amazing collection of images of the comet.